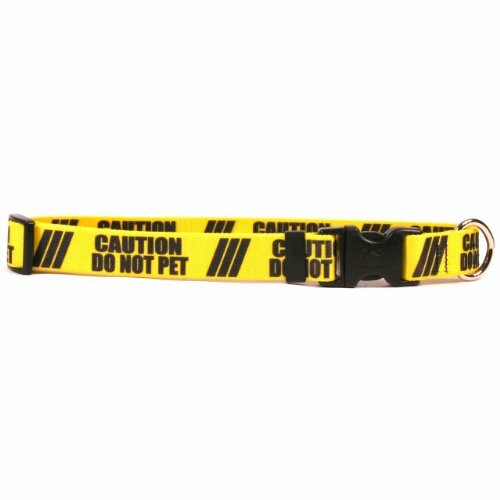 This is the 1 Inch - Caution Do Not Pet Dog Collar with Tag-A-Long ID Tag System - Size Small - 3/4 inch wide and fits neck sizes 10 to 14 inches from Yellow Dog Design, made right here in the USA. Keep your dog in the latest fashion with this stylish, functional and durable dog collar. TAG-A-LONG - This brand new, patent pending Pet ID Tag system is built right in to this dog collar. The Tag-A-Long system makes it easy to swap out ID tags from one collar to another, or to change ID Tags on the same collar. Perfect for when a special tag is needed at the dog park, on the beach, or as a service dog. We've included this special feature at no cost! EASY ON EASY OFF - Using a quick release clasp, the collar can easily be taken on or off the dog. Don't worry though, opposable thumbs are necessary to activate the quick release. SIZING: This dog collar utilizes a quick clasp closure, also called a side release clasp. Sizing is given as a range of neck lengths. Measure your dogs neck size or its current collar length (not including buckles) to obtain correct sizing. If you are shopping for designer, affordable dog/pet collars, then look no further. These durable, guaranteed to last dog collars have no rough edges, no threads to fray or break, no problem going in the wash, and no stress getting them on or off your dogs. MADE FOR ACTIVE DOGS - 100% smooth & durable polyester, these collars are built for comfort and action. Great for outdoor dogs, water dogs, field dogs, and service dogs. Machine washable and weather resistant. WARRANTY - 100% GUARANTEED - These dog collars are backed by the Yellow Dog Design 100% Guarantee. Covered from fraying, defects, fading, and even chewing. DO NOT USE FOR TIE OUTS! MADE IN THE USA - Manufactured from start to finish by Yellow Dog Design Inc in Greensboro NC. Every time you purchase this product you are directly supporting US Manufacturing and US Jobs. We appreciate your support of our family business! If you have any questions about this product by Yellow Dog Design, contact us by completing and submitting the form below. If you are looking for a specif part number, please include it with your message. Pet Attire Ribbon Adjustable Nylon Collar with Aluminum Buckle, 1" x 26"